CAN PITTSBURGH SUPPORT AN MLS FRANCHISE? One of the topics that seems to come up often among casual sports fans and members of the mainstream local sports media when the Pittsburgh Riverhounds and the sport of soccer are mentioned — is Major League Soccer. There are people who seem to want to validate the merits of Pittsburgh becoming a legitimate market for a MLS team. 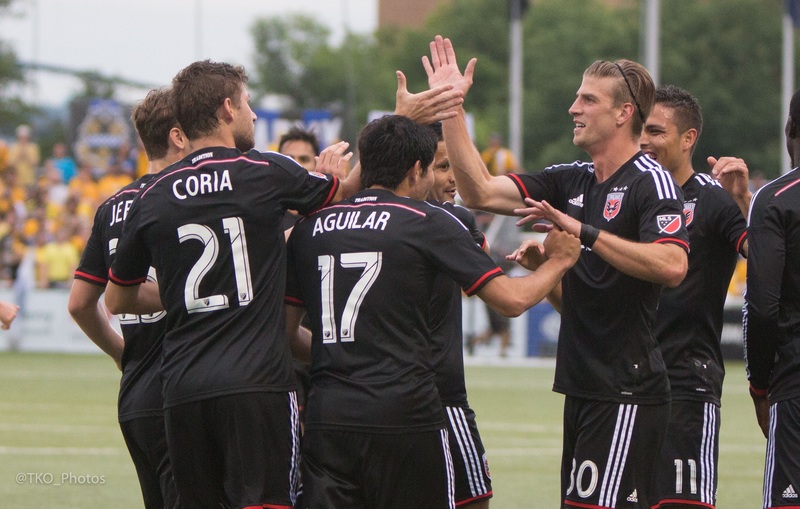 One of MLS’ signature franchises, D.C. United, came here last month taking on the Hounds in the 4th Round of the Lamar Hunt U.S. Open Cup game that generated a lot of excitement. It was a nice showcase on June 18, as the Riverhounds played in front of a lively, packed house which provided a fun soccer atmosphere – with a full supporters section singing and chanting, and an overflow crowd watched as the local team played against one of the top professional teams in the U.S. soccer pyramid. To the Riverhounds credit, they took United to the limit, until losing 3-1 in extra time. Some will point to Highmark Stadium, Pittsburgh’s scenic new stadium, as a foundation for a bid to MLS. As someone who has played and coached both for college and high school programs in our region – I’ve seen first-hand soccer’s course of plodding growth in the past 20 to 25 years in Western Pennsylvania. I can tell you that there’s nothing I would want to see more than watching the highest-level of soccer played where I live — to provide a fascinating new chapter to the Pittsburgh sports lore in the 21st century. That being said, it’s not going to happen anytime soon. I want to make it clear that Pittsburgh, a market that may be experiencing more interest in soccer of late, has the potential to be a very good place for a professional men’s soccer team to thrive. The Riverhounds in their existence, have toiled between the second and third tiers of professional soccer — and in this time have mostly been stuck in a fight for relevancy, survival mode and stretches of mediocrity. By all indications, under the direction of the current ownership and leadership, things seem promising as the Hounds are trying to turn the corner. For one thing, this year, they’ve put an exciting product on the field, with the USL’s Eastern Conference’s top scoring team. But they still have work to do. Much of this MLS talk came to the forefront when the team moved into Highmark Stadium in 2013, as the new facility generated excitement, catching the attention of local sports fans and national media. At the time, some Riverhounds officials might have gotten carried away with some delusions of grandeur — touting the potential for even bigger things– dare we say it — that within ten years that they could be a legit contender to bring Pittsburgh a Major League Soccer franchise. But sometimes you have to have your house in order first. The Riverhounds franchise was founded in 1999 as United States Soccer Federation created a groundswell for a second (and eventually a third) professional soccer divisions that would provide more opportunities for even more home-grown player development following the debut of Major League soccer in 1996. Prior to 1999, lower-tier soccer leagues were a mixed bag of semipro teams and clubs that played before little or no fanfare — some brought together by immigrants hoping to continue playing the sport they once played in their home countries. In the decades prior to that, Pittsburgh’s only professional soccer team had been the Pittsburgh Spirit, of Major Indoor Soccer League (MISL). In their 15-year history, the Riverhounds have had some mild successes (best season was 2004 – posting league best 17-2-1 mark, but lost in semifinals of USL Soccer League playoffs). For the most part though, the Hounds have never won a league or Cup trophy fielding mostly mediocre to below average teams while playing at high school stadiums — and for a year at Minor League baseball park. Their highest average attendance peeked in their inaugural season with 4,192 fans per game at Bethel Park High School. Their first season in Highmark Stadium in 2013, saw an upsurge to nearly 3,300 fans per game, but even that number has dropped. While the demographics are shifting in Pittsburgh, it still seems as if the generational gap between those who have grown up playing and watching soccer, and those who don’t know much about the game or refuse to watch is still pretty divided. Looking at some of their peers who’ve been regular A-League and USL league foes during the past decade plus — Rochester, Charleston, Richmond, Charlotte and even their in-state rivals Harrisburg — have all been more successful on the field and drawing more fans on average. 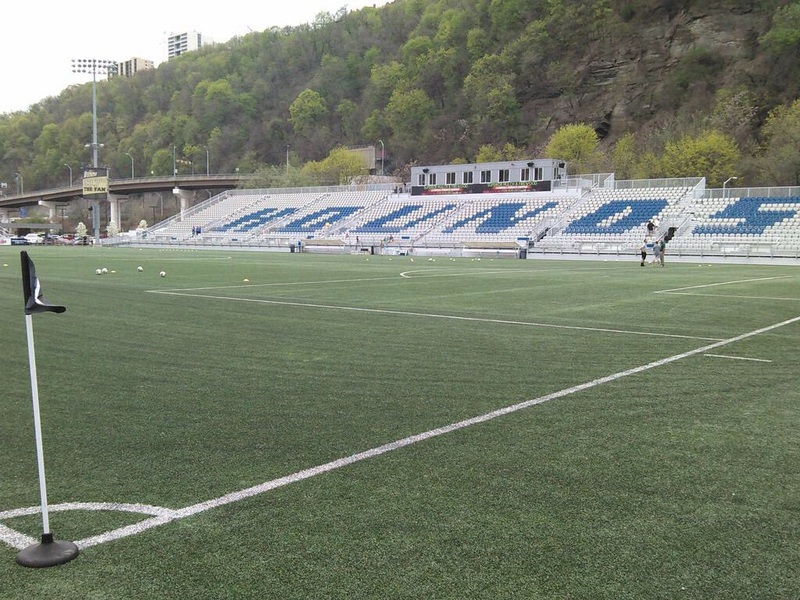 The move to a new stadium certainly came at a cost (the Riverhounds voluntarily filed Chapter 11 bankruptcy in 2014 before resolving by end of year). The good news for the Riverhounds, is that they have survived a potential extinction just as professional soccer is expanding by leaps and bounds across the country. Their current league, United Soccer League (USL), has expanded greatly and has developed a formal partnership with MLS. Fueled by a mandate from MLS for each of their teams to have an affiliation or develop a second-level team of their own, the league has grown from 14 teams in 2014 to 24 teams in 2015. By 2016 or 2017, it’s very likely there will be 28 to 30 teams in the USL which has already been split into two geographical conferences. After a one-year affiliation with MLS Houston Dynamo in 2014, the Riverhounds are now operating on their own, as one of the few USL franchises without an affiliation. Another area that completely gets overlooked by local media members in particular is the level of players in the area. The Riverhounds have been around for over a decade and a half. Yet, the amount of players from the Pittsburgh-area who have played in MLS can likely be counted on one hand. The Riverhounds Academy programs exist, yes, and they may have even had a fair amount of success at times. United States Soccer Federation has put a lot of emphasis in the past few decades with the pro teams building academies that can help improve the level of home grown players and prospects. Locally, the Riverhounds’ academy teams have yet to produce any “home-grown” talent that has fed into the senior club, even further into the MLS or getting consideration for the U.S. National Team. Each year, the Hounds have a few local players on their roster, but only a few will ever play beyond this level. The Riverhounds first ever draft pick and long-time player, Justin Evans, had played some MLS and overseas, but was the exception. Some may point to Gibsonia’s Meghan Klingenberg that Pittsburgh can indeed produce top level soccer players. That is true — but there are different avenues that most female players go through. Klingenberg honed her skills playing four years of soccer at the University of North Carolina. The women’s national team still relies on College programs to be the primary source of player development, whereas elite men’s players are moving more and more toward academies, turning pro by 17 or 18 years of age — and further away from the college ranks. Bottom line is Pittsburgh needs to start producing more of its own talent. One sport where soccer can take some cues, and we are starting to see this come to fruition in our region is hockey. This is going to take some time — and the Riverhounds need to keep building their academy to develop more home grown players from our region for the sport to blossom. In summary, the Riverhounds are a franchise that are still trying to build success at USL level as they struggle to fill their 3,500 seat stadium to capacity for every one of their 14 to 16 home games per season and they have a lot of work to do to have a role in developing a stronger talent pool from the area. So, lets not put the cart ahead of the horse. We need to develop our horses first. Major League Soccer began operating in 1996, two years after the United States hosted it first-ever FIFA Men’s World Cup tournament. One of the conditions from FIFA for the U.S. to host the World Cup was to develop a sustainable professional soccer league. The immense success of the World Cup being held on U.S. soil in 1994 (still remains the most attended FIFA World Cup), provided the momentum to create an upstart league. Today, MLS is celebrating its 20th season, including two new franchises — a second New York-area team (Manchester City/NY Yankees co-owned NYCFC) and Orlando City FC (a former USL franchise). With some bumps along the way, the league has shown gradual and steady growth. The impact of MLS’ progress was on display on the World stage in 2002. That’s when the U.S. Men’s National Team made a surprising and successful run in the 2002 World Cup, advancing from their group, upsetting highly ranked Portugal, and then regional rival Mexico in the Round of 16, eventually losing to Euro powerhouse Germany 1-0 in the Quarterfinals. That 2002 U.S. team was coached by a MLS coach (Bruce Arena), consisting mostly of young players from the first generation of the new league’s stars who had got their start playing here at home. In comparison to the long-standing and successful leagues in England, Spain, Germany and other places, the MLS is not on par in terms of quality of players, notoriety and fan support. But it’s building some steam. Major League Soccer began to demonstrate positive signs of long-term profitability as early as 2004 with the single-entity ownership structure, salary cap, and the media and marketing umbrella Soccer United Marketing (SUM) all contributing towards MLS’s financial security. As soccer-specific stadiums are built, ownership expands, and television coverage increases, MLS has seen its revenues increase while controlling costs. It’s now also becoming commonplace for many of soccer’s biggest stars to find a home in MLS in their later years. While he wasn’t the first to make the move, global icon David Beckham’s move to MLS last decade certainly helped provide a lot of exposure for the league. Other stars have followed in the years since. With broadcast revenues and salaries increasing, MLS continues to be in expansion mode. By 2017, with addition of teams in Atlanta, Minnesota, Los Angeles and most likely Miami — there will be a total of 24 teams. Franchise fees for the newest teams to gain entry into MLS exceeded $100 million. On average, every MLS team is now worth in excess of $100 million — almost tripling in value since 2008. Some traditional soccer fans have vouched for the United States to develop a “Promotion-Relegation” system, where teams that finish in the bottom of divisions are relegated to the lower division, and those in the lower divisions are promoted to the higher division if they finish in one of the top spots. At this point, Major League Soccer organizational structure and revenue sharing system will make it very hard for this system to become a reality in North America. MLS will reach 24 teams by 2018. Beyond that, they could be adding more teams between 2020 and 2024. It’s likely that they will stop when reaching 28, maybe extend to 30. Three other markets look like sure bets to be serious players, Sacramento, San Antonio and St. Louis. Sacramento played before USL-record crowds (averaged over 11,000 fans per game) in their first season, which they also won the league. They appear to be following in the footsteps of Orlando City, which in a very short period of time, rode a lot of momentum from their success in USL (also won a couple of championships and led the league in attendance) to be awarded a MLS franchise that began play this season. San Antonio leads the second-division North American Soccer League (NASL) in attendance, and they’ve announced their intentions to bid for a MLS team. The other possibilities include St. Louis, which debuted a USL team this season. What the MLS will require includes having a soccer specific stadium of at least 18,000 capacity and as previously mentioned, $100 million (or more) entry fee. 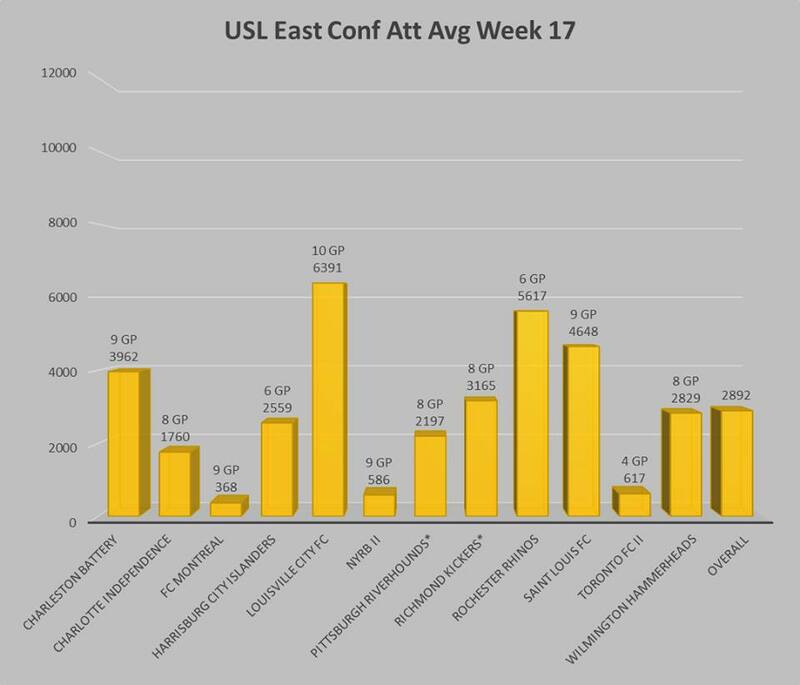 If you look strictly at USL’s attendance figures, the Riverhounds are in the lower half of the 24 teams, and only ahead of the three MLS 2 teams and Charlotte in the Eastern Conference thus far in 2015. Louisville and St. Louis are in their first seasons in USL, and their attendance figures have been impressive. Rochester is home to a 15,000 seat soccer only facility — and have team with the league’s best record. Charlotte and Richmond, as previously mentioned, have stronger bases than the Riverhounds. It’s safe to say that work needs to be done here in Pittsburgh before Major League Soccer conversation can even be brought up — and it becomes a viable option. – Start developing a stronger local talent pool of home grown talent. Would it be too much to ask to see more players drafted to MLS from the region — and more local players on the Riverhounds roster? Quite frankly, even if the Riverhounds would somehow exceed these by leaps and bounds, they would still have a tough time getting an MLS franchise in the future.